Ladies and Gentlemen, step right up! Grab the popcorn and check your brains at the door: Pacific Rim is this year’s first legitimate summer blockbuster. Guiellermo del Toro, writer/director of original fare such as Hellboy andPan’s Labyrinth, ratchets up the scale for this epic creature feature while retaining the intimate, child-like wonder that make his movies so accessible. The result is a fun ride, especially in IMAX 3D, that eschews deep dialogue and plot for the sake of watching monsters and robots beat the crap out of each other. While the appeal is certainly reminiscent of TV shows like Mighty Morphin Power Rangers and The Big O (I wouldn’t be surprised if we saw Pacific Rim action figures, lunchboxes, and other tie-ins), the flick’s action and production value ensures that it remains enjoyable, whether you’re a 12-year-old boy or not. 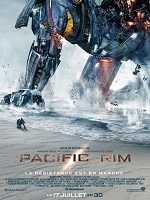 Pacific Rim opens today in Philly area theaters.